Camel crickets are light to dark brown and they can be mottled and have dark banding on some of their body segments. Adults are wingless and grow to between ½ and 1 ½ inches in length. Camel crickets get their name from their humpbacked appearance. 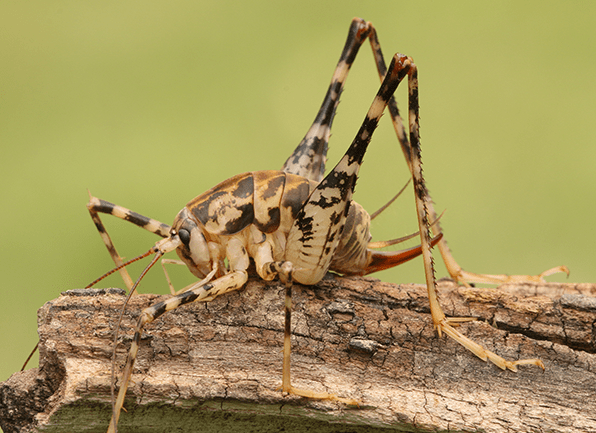 These crickets have very large powerful legs that they use to jump away from predators and other dangers. Camel crickets are nocturnal which means that they hide during the day and come out a night to feed. Female camel crickets lay their eggs in the early spring and the eggs hatch in April. Camel crickets are wingless, so they don’t chirp like other species of crickets. Camel crickets seek shelter inside of homes and other buildings during the winter months and they overwinter as either adults or nymphs. Camel crickets enter inside of homes and other buildings if the weather becomes too hot or dry for their liking. Outside camel crickets are found living underneath of stones, wood piles, mulch, landscaping ties, and fallen trees. Inside of buildings, camel crickets like to hide and live in basements, crawl spaces, laundry rooms, and other areas that provide them with dark, damp environment. Camel crickets are not known to carry or transmit any diseases that affect people. Inside of homes camel crickets may feed on and damage fabric items. Place a barrier between your home’s foundation and any mulch or grass. Seal any cracks in your home’s foundation or exterior walls. Caulk around basement doors and windows, and be sure that door sweeps are installed. Be sure that your home’s gutters are routinely maintained to ensure that they are working properly to direct water away from your home. Use dehumidifiers or air conditioners in your home to reduce humidity levels. Reduce clutter in basements, closets, and other storage areas to limit the areas inside of your home that they have to hide.